Spam is a real nuisance that can really have an impact your comments. It clogs up your comment queue and quickly dampens any excitement you may have had about receiving a comment. I mean, there's nothing more despondent than realising the comment languishing in your comment folder is totally unsuitable for publishing. The answer is to install a spam blocker (I like to call them spam eaters!). This is a piece of software that captures all the comments that come into your blog and sorts them out whether they are spam or not. It has the capacity to totally eliminate really nasty spam (so you don't get to see it) and to place suspect spam into a spam folder. This allows you to check it to make sure it really is spam before you delete it. This is a good thing, because I have found some real comments from proper readers in that folder, and have been able to 'rescue' them just in time! Which spam blockers do you recommend? The most common example of spam blockers for WordPress users is Akismet. It is usually inserted as standard into your plugins page in your WordPress blog or website. All you need to do is to activate it (by obtaining an Akismet API key, the plugin details give you precise instructions) and it will start eating your spam straight away! This is usually all you need to sort out your spam when your blog is new, and you are beginning to accrue a readership before the spammers get to know who you are. What would happen if I didn't use spam blockers? I had a friend who proudly showed me his new blog. "Look", he said, "I've got so many comments from all of my readers, isn't that wonderful?". Actually what he had been publishing was spam. He was unable to recognise that all these ingratiating comments weren't from real readers, but were from spam bots who had been having a field day with his blog. Another lady asked me to review her blog. I noticed how slow it was to upload. Then I noticed she had over 1,000 comments on one of her posts! All of these were spam, which had been sending out the wrong messages to the search engines ever since. 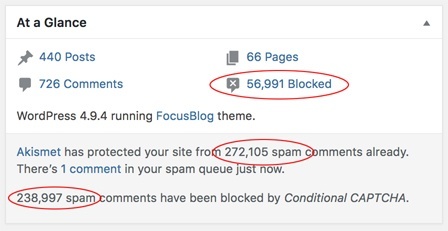 You can assist your spam blockers further by checking out the Discussion Settings of your blog. Many bloggers neglect to look at their Settings, in particular the one to do with comments. This gives you more control on how you readers can comment on your blog. Whether each comment is manually approved first, or whether previously approved commenters can automatically be accepted without moderation (beware of this though!). You can regulate where spam is sent to before deletion, and even can block malicious spammers who beat your spam blockers by recording their IP addresses or any other element they use. What happens when Akismet cannot cope? My Fairy Blog Mother blog has had problems with spam in the past. This is because it has been going for a long time and has drawn a lot of attention to itself. And how I am hardly troubled by spam at all (look, I've only got one in my spam queue – woohoo!). 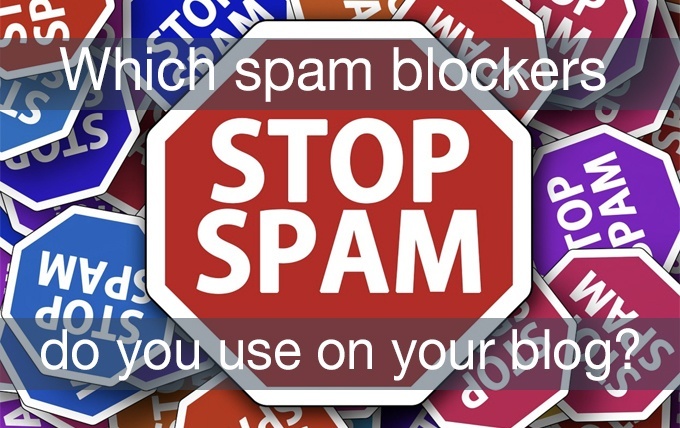 However, there are other spam blocker plugins which many bloggers recommend, and if you search for them I'm sure you will have fun reading the blog posts that list them all. But I would ask around your friends and on forums and discussion boards which ones are mostly used and why, before making your decision to install them. What do you think about spam blockers?